Retailers need systems to record movement sat entrances and exits, monitor activity, and keep track of inventory and transactions. To achieve this, a myriad of electronic systems for security and loss prevention are used. At all retail premises, entrances and exits are carefully guarded. Typically, the shop floor, offices and warehouses use traditional card-based access control systems. "There is a requirement to know which staff have entered these areas and when, along with real-time information about where members of staff are at, for health and safety reasons," said Mike Sussman, Chairman of Access Control at the British Security Industry Association. Access control systems can apply alarm conditions, which indicate when a door has been left open, to better protect loading docks or warehouse areas. Most retailers use analog video surveillance systems for forensic purposes. Developments in video analytics, image resolution and network cameras have transitioned video surveillance for use in business applications. People, queue and zone counting, as well as heat maps and dwell time, give retailers a wealth of information to improve marketing and sales operations. "Throughout a store, cameras usually monitor PoS terminals, as well as high-value items and attractive merchandise, such as makeup and perfume," said Johan Akesson, Director of Business Development in the Retail Sector at Axis Communications. Improved image resolution gives retailers better image quality and a bigger view. Connecting high-resolution cameras to PoS and electronic article surveillance (EAS) systems allows users to see details, such as the markings on a bill. It also makes it easier to identify individuals, if required. Shoppers who see cameras placed around a store will be less likely to steal. "Today, retailers project surveillance images onto a digital signage screen, so that shoppers can see an image of themselves when entering a store. Notifying shoppers that they're being watched can deter theft," Akesson said. For malls or department stores with large viewing areas, such as food courts or lobbies, high-resolution cameras can cover large areas with improved picture quality. "PTZ cameras can be found more in retail applications, because suspicious behavior requires tracking, particularly at entrance and exits," said Raymond Weijts, Marketing Manager for Recorders and Storage at Bosch Security Systems. Lighting presents a challenge. Bright light can produce sharp contrast, making it impossible for traditional security cameras to see events unfolding inside trucks at loading docks, or dimly lit entrances, said Brian Leland, VP of North American Sales at Samsung Security. Developments in WDR provide clearer images under backlit conditions and lessen problems caused by glare. Motion adaptive digital noise reduction can clear up dark gray images, and digital image stabilization can remove the blurs of motion to provide crisper still images, Leland said. For the most part, awareness of video analytics is low. Considering the size of the retail industry, users who have successfully implemented and can afford analytics are still in the minority. "In the past, most large retailers cooperated with third-party consultants who analyzed the video footage provided from their stores separately," said Huw Edwards, MD of iCode Systems. Increasingly, retailers are beginning to adopt video analytics, but there is still a large learning curve associated. One reason why retailers are hesitant about analytics is that most algorithms, with the exception of those measuring dwell time, require cameras to be ceiling-mounted facing straight down, said Hakan Moran, Director of Marketing for Cognimatics. "This allows you to see the shop from a bird's-eye view, eliminating the problem of obstruction (such as a person standing in front of another person)." Budget restrictions prevent retailers from purchasing dedicated cameras for analytics. "If clients want to use all the algorithms offered in a single store, they would have to purchase separate cameras for separate algorithms," Moran said. However, improved business intelligence has generated ROI, so much so that marketing and sales departments at large retailers have begun requesting video analytics. Analytics helps store operators understand customer behavior. People counting algorithms have had the most success. Deployed at entrances and exits or in front of certain displays, these algorithms measure the flow of people. Retailers can use counting to generate statistics on how many people stand in front of certain displays, and how that changes with different displays, Moran said. These algorithms can also be deployed at PoS terminals to optimize cashier management, by increasing staff during peak hours. Heat maps help retailers identify which areas are hot spots, such as displays for promotional products. Dwell time algorithms measure how effective advertisements are, keep track of who passes an advertisement or display, and record how long they linger. "Combined with people counting, you can see how many people pass by your display, how many of them actually look at the advertisement and how long they look for," Moran said. For security-focused purposes, forensic software enhances video to resolve and clear images, which can then be used for biometrics measurements and loss prevention. "Our forensic software for video monitoring can clarify identification features by measuring a person's height, size and shoulder width. It's true 3-D measurement-based, not just pixel-based," said Lenny Rudin, CEO of Cognitech. "In case of a breakingand-entering event, the software can help with video enhancement, stabilization and measurements of suspects to better identify a perpetrator." Most retailers have DVRs or dedicated servers for PoS or video data, operating independently of other systems. More retailers are replacing broken DVRs with NVRs, as NVRs are easier to maintain. "If there's a problem, software such as analytics can simply be reloaded, whereas for DVRs, the hardware might need switching out, resulting in a whole new installation of software as well," said Derek Rodner, VP of Marketing and Product Strategy of Agilence. Technologically savvy customers are beginning to adopt virtualization technologies, using one large machine to store multiple systems and data. "This way, customers can gain economies of scale," Rodner said. Since video surveillance takes up the most storage space, retailers are also interested in onboard camera storage. "Particularly for smaller retail applications, built-in standard definition card storage and free viewing software make these small camera systems cost-effective surveillance solutions," Weijts said. For displays, more retailers are currently replacing simple public view monitors with IP-based and multipurpose displays, which allow surveillance systems to be integrated with other systems, such as emergency notifications, weather alerts, business intelligence and advertising, said David Gorman, COO and Executive VP at VuIT Communications. No strangers to retail, EAS and RFID technologies track items for anti-theft, inventory management and product authentication purposes. Michael Liard, Practice Director from ABI Research, said in a prepared statement, "We expect the overall RFID market to exceed US$8.25 billion in 2014, whereby the greatest growth will be found in real-time location systems, which includes baggage handling, animal identification and item-level tagging in fashion apparel and retail." Recent developments include EPC Global implementation guidelines for GS1 RFID-based EAS, which provide a standardized method for using electronic product code and RFID as loss prevention tools, said Paul Chamandy, VP of New Business Development at Avery Dennison. "With this guideline in place, we expect manufacturers to become more willing to provide tagged merchandise to their retail customers." Retailers will displace single function EAS technology with item-level RFID, which cuts costs and offers multiple benefits. With legacy EAS systems, the tags only performed the purposes of deterring and detecting theft. 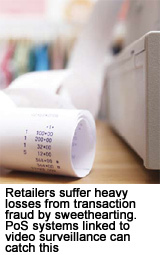 RFID provides a preemptive action capability to retailers at a level that EAS cannot generally match. Since each product has a unique ID, RFID also allows the retailer to identify a stolen product that someone might attempt to return for refund, Chamandy said. In the past, RFID for security purposes used high-frequency tags. The majority of these tags were attached by the retailer in the retail shop. "Now we're seeing a trend of ultra-high frequency tags, which is more universal, reads over greater distances and can be used from the beginning of the supply chain all the way to the retail shop," said Jerry Garrett, MD of Convergence Systems. Studies conducted by large retailers, such as Marks & Spencer, showed tagging high-value apparel eliminated stock outs and increased revenue. Often, if the item on the shelf is not the right size, people will not purchase the product. With RFID, retailers can find missing garments and replenish them much faster. High-end retailers are investing in RFID for smart shopping. Customers can purchase loyalty cards, which have their credit card information stored on it, and walk through a gated area for self checkout without going through a traditional checkout counter, Garrett said. New concepts like the "magic mirror" revolutionize RFID applications. In a clever bid to increase revenue at apparel stores, RFID providers have deployed tag readers inside changing rooms to scan chosen garments, which display matching accessories. "This is a smart retail window – you need to preload all these images onto the system and cross reference the garments," Garrett said. Assuming customers do not bring in a large number of garments, these "magic mirrors" can become useful to shoppers. High-end apparel stores currently deploy these systems, with successful shops generating significant ROI. Another development is the smart shelf. Near-field antennae have made it possible for shelf-level reading. "Every night, shelves are stocked. Every day, you can get a report on how many items were picked up off the shelf, then check whether that item went through checkout and if it was sold," Garrett said. Retailers can provide this information back to the manufacturer of the consumer product, with information on how much they sold and how many of each item was picked up off the shelf. "It gives resolution and granular detail to that last meter of purchase — size, style, cut and so on," Garrett said. However, retail stores comprise not only shelves, but also racks and other display furniture. "With racks, it's a bit complicated to put the antenna on the pole itself, but you can embed small antennae near the racks. The distance is programmable, from less than a meter to up to eight meters," Garrett said. Accuracy depends on the read range and how many items are being read simultaneously. Typically, an antenna reads only one or two items at once. Retailers suffer heavy losses from transaction fraud by sweethearting — where cashiers purposefully do not scan an item, enter unauthorized discounts, make fraudulent returns, put manual entries into the system, and soon. Traditionally, PoS fraud is monitored by surveillance staff through a PoS terminal or by manually searching through recorded footage, Weijts said. Exception-based reporting (EBR) are simple recording tools and have been around for more than 15 years. These stand-alone systems require users to manually take all recorded transactions at the end of each day and load them into a central repository, Rodner said. This is not line-by-line reporting, which means that information gets lost. For example, a price check, can become fraud if the cashier scans an item, punches in the price check button, and passes it off without ringing it up. PoS systems linked to video surveillance can catch this, as users need only search through PoS history and match the transaction with the video footage. "At a centralized level, you gain visibility and see patterns that allow you to identify shrink activities not necessarily related to fraud, such as operation, efficiency and training issues," Rodner said. A strong in-store analytics platform integrated with on-shelf availability systems can automatically capture every time a product is "picked" from the shelf and correlate it with PoS data and backroom inventory stock, Howe said. This type of insight can help retailers decrease out-ofstock situations and ensure product availability during peak traffic times, helping improve conversion and overall store performance. "Basket analysis — analyses based on how the purchase of one item will affect the likelihood of people purchasing another type of item — can improve market research and streamline operations. This means that studies and results from intelligent POS systems are much more granular and can be used to improve the shopper's experience," Howe finished.